The 730 mile Green River flows through some of Utah’s most beautiful, and rugged countryside. Along its route the river offers some of the best outdoor recreation opportunities in the state, including boating, fishing, and camping. At just over 730 miles, The Green River is one of the longest rivers in the United States. In Utah, the river passes through several national parks before merging with the Colorado River in Canyonlands National Park. The river is well known for its outdoor recreation, with popular activities including white water rafting, camping, and fishing. At over 730 miles long, the Green River is accessible from many points along its flow. For boaters, popular launch points include Green River State Park, Ruby Ranch, or Mineral Bottom. The area below Flaming Gorge damn is a popular area for fly fishing. For beginners, or those looking for a relaxing day on the water, the 100 mile stretch of water running through Labyrinth and Stillwater canyons offer beautiful flat-water paddling. Boaters come to Lodore Canyon for a mix of breathtaking scenery and exciting rapids. 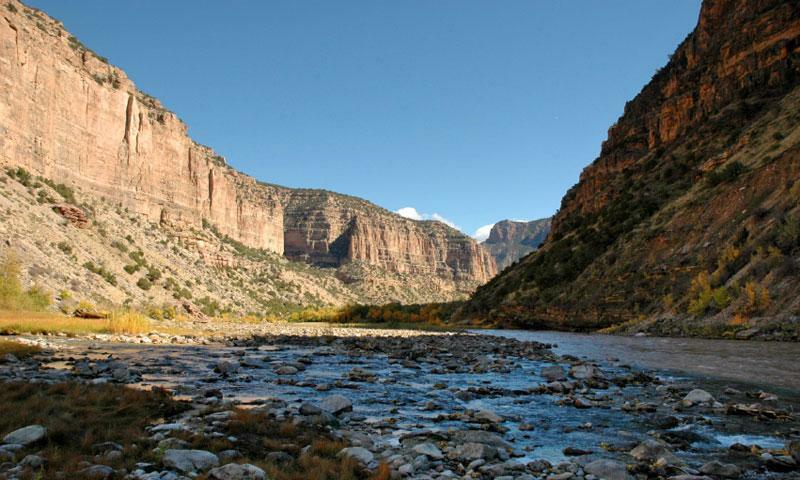 This 44 mile section of the Green River passes through Dinosaur national Monument, and is home to a range of class 2, 3 and 4 rapids, including three of the best rapids on the river: Disaster Falls, Hell’s Half Mile, and Triplet Falls. Desolation Canyon is home to 84 miles of Green River paddling. Perfect for families and beginners, the majority of Desolation Canyon’s waters are calm, though there are a mix of class 1, 2 and 3 rapids. Desolation Canyon is also home to historic frontier homesites, and prehistoric Indian Petroglyphs. Anglers come to the Green River for a chance to experience some of the best trout fishing in North America. While fishing in Green River, expect to bag brown, rainbow and cutthroat trout. The section of river just south of Flaming Gorge Dam is widely known as an abundant fishery. Green River state park, located in Green River City, is home to 40 campsites, with amenities including modern rest rooms, hot showers, a boat launch ramp, a nine-hole golf course, and interpretive programs. Though the campground is open year-round, restrooms close from early December until late February or early March. Sites cost $16. Reservations are accepted between March 15 and October 15th. Primitive campsites are often available along the river. The Bureau of Land Management strongly recommends campers stay on the sandbars along the river banks to avoid habitat destruction.